Arezzo is one of the oldest towns of Tuscany and is surrounded by four valleys: Val di Chiana, Valdarno, Valtiberina and Casentino. Thanks to its favorable geographical location has been the meeting point of different civilizations and cultures. The city of Arezzo has Etruscan origins but in all ages has been an important reference point, was a stronghold of the Roman Empire, a commercial basis in the Middle Ages and homeland of important artists during the Renaissance. Of each period, the city preserves important evidence visible in part outdoors, like churches and monuments, and partly kept in the city museums. 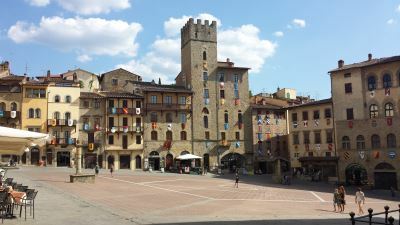 Among the most important works in Arezzo we suggest to visit the Romanesque church with the bell tower of a hundred holes, the cathedral with stained glass windows by Guillaume de Marcillat, the Basilica of San Francesco with precious works of Piero della Francesca, the Gothic church of San Domenico with crucifix by Cimabue. In the splendid setting of Piazza Grande dominated by Vasari lodges are held twice a year, the "Giostra del Saracino", the 3rd Saturday of the month of June and the first Sunday of the month of September. The first Saturday and Sunday of every month the squares and the streets of the city are the theater of the Antiques Fair where you can buy furniture and antique accessories. For shopping lovers in Arezzo you can find shops of major brands of clothing and precious jewels. In fact, Arezzo is home to several goldsmiths.